Got any bamboo? 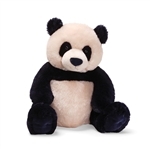 Our panda bear stuffed animals are interested in how much and how willing you are to share. These stuffed pandas and plush pandas love their bamboo and they love people that have lots of it. Now, don't go thinking that you can bamboozle our stuffed panda bears into thinking that some other plant is bamboo. These stuffed animals are no fools, especially when it comes to their beloved bamboo. Our stuffed pandas will love people without bamboo but it is definitely the quickest way to win them over. If you don't have bamboo then you'll need to be a little extra loving at first to make up for it. It's not going to be hard to be extra affectionate with our plush panda bears though because they are truly irresistible. They say it's as simple as black and white. Enjoy all of our stuffed panda bears and plush panda bears and don't hesitate to give us a call with any questions about them. One of our favorite things to do is to get the right people and the right panda bear stuffed animals connected!